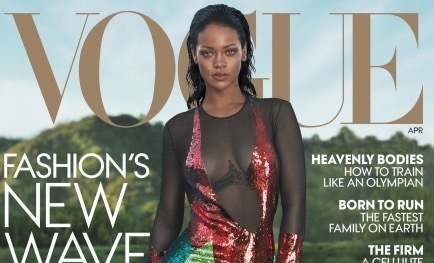 Rihanna is back with another Vogue cover for April, marking RiRi’s fourth appearance on the front of the fashion bible in five years (her Vogue debut was also in April). 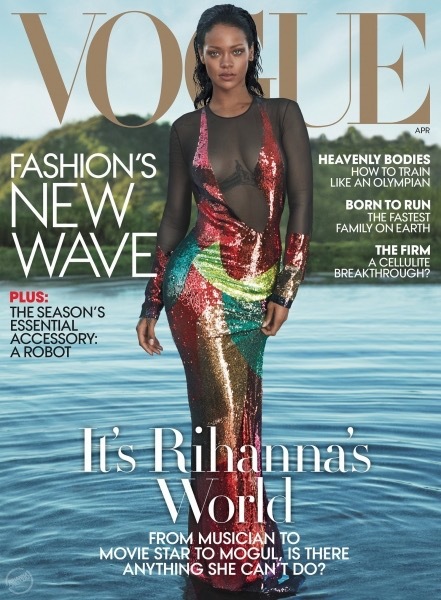 On the cover, the Barbadian who is currently on her ANTi tour is seen walking out of the water in a multi-coloured sequined gown from Tom Ford’s spring collection. In the magazine, the singer talks about the release of her new album “Anti,” her New York Fashion Week debut with Puma in February and the unveiling of her Manolo Blahnik collaboration. There’s also a scoop: she’s expected to release a line of sunglasses with Dior this season, too. Plus, we learn a few juicy tidbits that only Rihanna could reveal — like how not wearing a bedazzled thong with her see-through Adam Selman gown at the 2014 CFDA Awards was her greatest regret in life.